My friend Marina, who lives in California has just returned home from spending Christmas and New Years in Rome. Marina has very generously shared her story and photos with me for my blog. Markets are a time for indulging in holiday treats and Yuletide joy. It is a picturesque scene right out of a children’s storybook with thousands of sparkling lights strewn across stalls stacked with Christmas tree decorations, wooden toys, handmade arts and crafts, candles and ceramics. Here in Rome, the romance and magic of a traditional holiday is alive and well. The beautiful Vatican with its giant Christmas tree and nativity set which is unveiled the night before Christmas shortly before mass by the Pope. 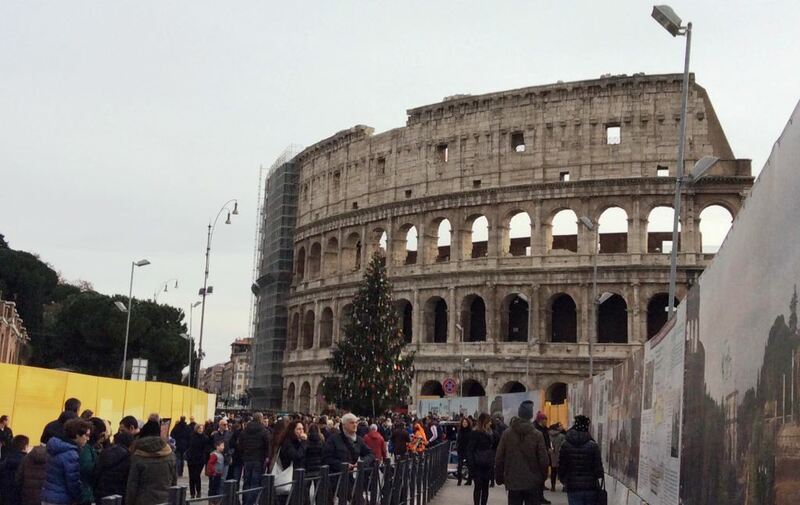 The beautiful Colosseo surrounded by ruins with a beautiful Christmas tree nicely adorned stands out front as many stand in front for a picture or two. Italians love festivals and the beginning of a new, ‘il capodanno’ is a great time to celebrate in Italy. As with most Italian festivals, food plays a major role on New Year’s Eve. Families and friends gather for a huge celebration. Locals gather in public squares to catch the midnight fireworks as bottles of Spumanti or Prosecco pop open. 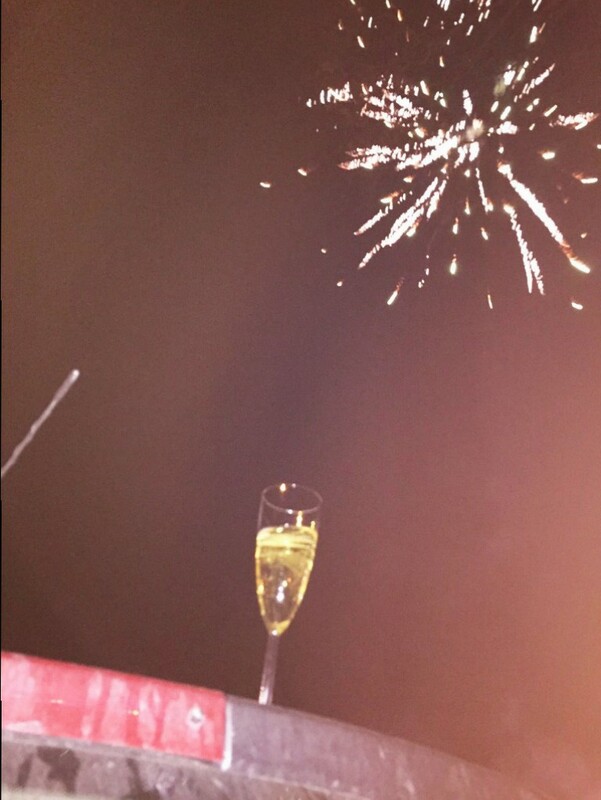 Families ring in the New Year with firecrackers and sparklers. The city of Rome illuminates with firework displays being shot up in the sky with happy Italians shouting ‘Auguri’. The star at the dinner table is lentils (Lenticchie) symbolizing money and good fortune for the coming year, and also includes pork sausage (Salsiccia) symbolizing the richness of life in the coming year, an Italian tradition that dates back to the 16th century. An old custom that is still followed in some places in Italy (especially in the south) is throwing your old things out of the window to symbolize letting go of any past unhappiness and your readiness to accept the New Year. Thank you Marina, this would be an amazing way to spend Christmas and New Years. Christmas in Rome sounds like fun. Yes it does. I hope to spend Christmas in Italy one year. What a wonderful time to be in Italy, I can only imagine the celebrations there. We will have to go over one xmas and celebrate with them. Thanks for sharing your blog Marina and thanks Lyn for passing it onto us all. Nice post, Lyn. What a great time to be in Rome. I’m sure it would make a fantastic memory. Beautiful holiday scenes. Thank you Marina and Lyn for sharing your Italian experiences. Buongiorno Lyn! So nice pictures…I stayed in Rome only once and I would like to go back immediately!!! Especially the first pics of the market are great!! Looks like your friend had fun! I was at home with two pizzas and a sick child! Oh well. I’ll find another occasion to drink prosecco. Happy New Year to you Lyn! Lovely post. Love the final photograph. Lyn celebrating Christmas in another country would be exciting. Experiencing it through your blog is also exciting. It certainly arouses interest.Another great idea to add to the innumerable list. Nice post. Is this the marina who stayed in my village of longoio?